In Season 1, Episode 10 of Aaron Sorkin's television drama The West Wing, President Josiah Bartlet takes several members of his staff Christmas shopping at a rare book store in D.C. Walking down an aisle with best friend and Chief of Staff Leo McGarry, Bartlet finds a book he recognizes, and the following exchange takes place. President Bartlet: Ooh! The Fables of Phaedrus—1886, first edition, red leather label, gilt lettering, engraved frontis. Phaedrus, you know—who was a slave but later granted his freedom by Augustus—wrote his animal fables in iambic verse. Chief of Staff McGarry: Well, nothing says Christmas like animal fables in iambic verse. President Bartlet: That's what I say. "Poetry & Popular Culture" couldn't agree more. Season's greetings, all. In the New York Times, Pulitzer Prize-winning poet and New Yorker poetry editor Paul Muldoon is on record saying, "I myself make no distinction between 'light' verse and—what?—heavy verse." Muldoon was speaking about Roger Angell's year-end poem "Greetings, Friends", one of the last remaining instantiations of the Carrier's Address—a retrospective ditty distributed by tip-seeking newspaper boys in the nineteenth and early twentieth centuries. If you want to see examples of Carriers' Addresses done up the old-school way—long, rhyming, stand-alone recaps of the year's events oftentimes penned and printed by newsboys themselves—check out the amazing collection maintained by the Brown University Center for Digital Initiatives. Radio Rhymesters? An Interview with "Irving Toast, Poetry Ghost"
A couple of weeks back, news broke in Iowa City that the local public radio station WSUI would no longer commit to broadcasting visiting authors reading from their work on "Live from Prairie Lights." When literary luminaries such as Marvin Bell and current Poet Laureate of Iowa Robert Dana started getting all hot and bothered over the apparently dismal future of radio poetry, it got "Poetry & Popular Culture" wondering about how other poetry radio shows are also faring. So we went a-looking. Turns out, we didn't have to look (or listen) all that far. Just down the road from Iowa City, radio poetry appears to be doing just fine on KRUU 100.1 Fairfield. Every Monday and Sunday, KRUU airs “Irving Toast, Poetry Ghost” with host Rustin Larson, who features live readings and interviews with new and established poets. "Poetry & Popular Culture" managed to catch up with Larson and chat a little bit about radio, poetry, “Live at Prairie Lights,” and the mysterious KRUU muse—Fairfield’s turn-of-the-century poet laureate Irving Toast. Chasar: When did you first think "Aha! I need to put poetry on the radio in Fairfield," and how did you make that happen? Larson: I said "Aha!" in April 2008. In years past I'd attempted to create a venue for poets through a magazine called The Contemporary Review. That lasted a few years and had maybe 80 subscribers at its peak. Even cheaply produced magazines cost more than what they bring in, so I eventually lost heart and gave up the project. But I still wanted to create some sort of showcase for writers. James Moore, KRUU’s station manager, had for a long time wanted to get me on board with a show. He told me I could do whatever I wanted, so I told him I wanted to do this poetry reading/interview show. I'd made lots of contacts over the years, and my first interview was in mid-April 2008. Chasar: What happens to poetry when it's on the radio? Larson: Many things can happen. In a phone interview the distorted sound of a voice on the line can make a poem sound even more elegiac, kind of like a long lost love speaking from the other side. Face to face in the studio, poets give their all. They produce better than regular readings—maybe because they know it's not live but a pre-recorded show; it's almost like they’re creating short recorded books. Since it's also an interview program there isn't this sense of floating aimlessly in space. I'm there to help channel the flow of ideas. Chasar: Was there really a Fairfield poet named Irving Toast? Larson: Irving Toast is the true spirit of poetry that lives in the hearts of all people. In some cultures he may go by a different name, but in my household he is known as Irving, and he has a robust imaginary history I hint at in my blogs. Chasar: The true spirit of poetry? Didn't that go out with the Edsel? Larson: What's an Edsel? I'm kidding. The spirit of poetry is alive. There’s so much interest in poetry here in Fairfield. A fellow here has created a kind of dinner theater out of poetry at a local cafe. The Maharishi University locksmith is a poet, and quite a good one. The bookstores and coffee houses are wonderful about hosting readings, open mics, and concerts. It's not just here, though. I have nearly 1000 Facebook contacts from all over who are into poetry; many of them have literary presses or host podcasts or radio shows too. Some have appeared on my show (archived and downloadable at http://www.kruufm.com). Chasar: How can you make a go of it when WSUI and “Live from Prairie Lights” can't? Larson: I'm sad "Live from Prairie Lights" was canceled. It did great things for writing, and it really created an event rich in atmosphere each time folks gathered for a reading. But as my station manager says, KRUU is Local Public Radio, not National, so we're not beholden to NPR for sponsorship, consultants or dictates. We don't have any specific formula for how each slot must bring in X amount of money or listenership. We are who shows up, and our mission is to give voice to the community—to empower folks to ask questions and create programming themselves. We have 100 people producing 80 shows a week, have logged 60,000 volunteer hours, draw 100,000 visitors to our web site, and last year had an entire operating budget of $24,000. We do it without shoestrings—via listener support, underwriting, benefit concerts, small grants, partnerships and donations. Chasar: Has Garrison Keillor called you yet? Larson: No, but it would be great to talk to him! I think his Writer's Almanac is another great example of the spirit of poetry being alive. I don't know how many hits his web site gets, but I bet it's a bunch. It's a resource I've used to find poems myself. A version of this interview appeared in the Iowa City Press-Citizen on Wednesday, December 17, 2008. You say you like the North side best? We’ll say we like the South. Talk badly to the press of us? We’ll slug you in the mouth. Send our guy to the hospital? Yours will show up dead. Brag your books are in the black? We’ll cook ’em till they’re red. Hope to hold your convention here? And your guy goes to Washington? It's a blustery, cold and icy day here in Iowa City, the sort of day that leaves "Poetry & Popular Culture" wishing for either the end of winter or a swanky winter home in Boca Raton—or both. But finding neither, we turn for solace to one of our favorite movies about the end of winter, the 1993 Harold Ramis film Groundhog Day in which Bill Murray plays Phil Connors, a cranky, self-centered misanthrope doomed to repeat the same day over and over until he finally learns to love humanity and thereby earns the affections of his producer Rita, played by Andie MacDowell. 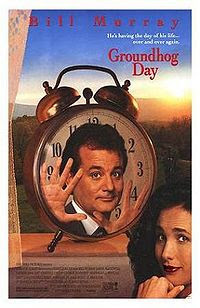 In 1996, Groundhog Day earned a spot on the United States Film Registry as a "culturally, historically, or aesthetically significant" film. Could it have been for all of the poetry in the movie? "Poetry & Popular Culture" thinks maybe so. Over the course of the story, after all, Connor learns to love humanity by learning to properly love poetry as well. In an early attempt to land Rita in the sack, for example, he quotes a verse from the French poet Jacques Brel. Later, he quotes a Samuel Taylor Coleridge poem. And toward the end of the movie, as Rita dozes by his side, he is shown holding Harriet Monroe's Poems for Every Mood and reading aloud to her (Rita, not Harriet) from Joyce Kilmer's "Trees." Far be it from "Poetry & Popular Culture" to underestimate the kismetic qualities of Kilmer; when Connor wakes up the next morning, Rita is still by his side, the curse is broken, and Connor begins the rest of his life as a new man. Our favorite scene here at "Poetry & Popular Culture," however, comes early in the movie before Phil begins the self-improvement program that sets himself on the road to existential recovery. In that scene, Rita and Phil are sitting at a table at the Tip Top Cafe where Rita watches Phil hedonistically embrace his newfound immortality by stuffing himself with rich, calorie-laden foods. A buffet of flapjacks, donuts, and frosted cakes stretches between them, and Rita stares in disbelief as Phil drinks straight from a pitcher of coffee. Here's part of their exchange. Rita: Don’t you worry about cholesterol, lung cancer, love handles...? Phil [lighting a cigarette]: I don’t worry about anything ... anymore. Phil: That’s exactly what makes me so special. I don’t even have to floss. unwept, unhonor'd, and unsung .... Sir Walter Scott. Rita: What, you don’t like poetry? Murray: I love poetry. I just thought that was Willard Scott. I was confused. For those of you who are curious, Rita is quoting from the sixth canto of Scott's The Lay of the Last Minstrel. Apparently, those French poetry majors—not to mention Ramis and his Hollywood collaborators—know their British poetry pretty well too. 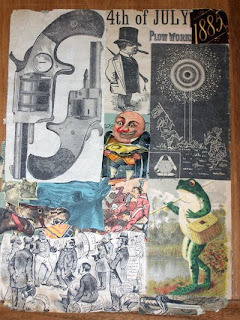 Between the Civil War and World War II, Americans were fanatical scrapbookers, cutting and pasting their way through all of print culture—magazines, newspapers, trade cards, advertisements, greeting cards, playbills, almanacs, broadsides, booklets, brochures and the like—and archiving any and all material of interest or even potential interest. Families sat down to scrapbook together. Louisa May Alcott said she read "with a pair of scissors in my hand," and her literary brothers and sisters kept pace: Mark Twain, Walt Whitman, Willa Cather, Jack London, Marianne Moore, Gertrude Stein, H.D., Sylvia Plath, Anne Sexton, Amy Lowell, Lillian Hellman, F. Scott Fitzgerald, Carl Sandburg, Carl Van Vechten, and Vachel Lindsay all kept scrapbooks of various sizes, stripes and sophistication. 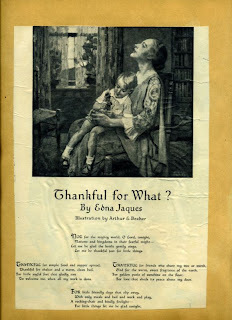 Of course, less celebrated Americans kept scrapbooks as well, and one of the more surprising things to learn about American scrapbooking is that it very often included poetry. Not just included, but centered around, focused on, and devoted itself to good, bad and ugly verse of all kinds. Americans sometimes maintained these personal anthologies for years, sometimes from generation to generation, sometimes working in concert with other scrapbookers. The resulting albums are fascinating artifacts from America's literary past. This scrapbook takes the months of the year as its organizing rubric, perhaps borrowing that structure from the farmer's almanacs that had been a regular part of American life since the 1800s. (Think of the almanac in Elizabeth Bishop's poem "Sestina," for example.) It begins with poems about Valentine's Day, then features a page spread on March which is followed by poems about April and a short illustrated narrative in verse titled "An Easter Eggs-ploit." 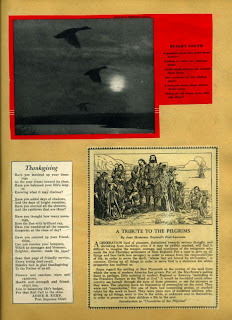 The section on Thanksgiving consists of seven illustrated poems spread out over the space of the three pages seen here. For that Roll Call in the skies. invite particular speculation about how inspirational or sentimental poetry functioned during times of economic crisis to both help people process the nature of that crisis and identify value systems other than capital by which they could orient their lives. For little things let me be glad tonight. In a sense, this poem asks for the power to be thankful for the commonplaces in life, not just in literature—for the valuable parts of living that have become, like their literary antecedents, ordinary or trivial over time. That is, in a sense, this poem wishes to extend the literacy practice of commonplacing or scrapbooking into a sort of philosophy of living in which the apparent scraps of life have unanticipated or unrecognized value. That's not a bad thing to think about this November 27 as we teeter on the edge of another depression and wonder where, oh where, the next bailout will come from. Here's the skinny on what's been happening literature-wise in Iowa City of late. After several years of application-making, bell-ringing, and horn-tooting, Iowa City was named a UNESCO "world city of literature," joining Edinburgh, Scotland, and Melbourne, Australia as the only other cities in the world with that designation. Check out the press release yourself here. Way to go, Iowa City. At the same time, as it was becoming clear that Iowa City would indeed achieve "world city of literature" status, Iowa Public Radio announced that it would be dropping "Live From Prairie Lights" from its programming schedule. For as long as most people remember, "Live From Prairie Lights" has broadcast visiting poets and fiction writers reading, well, live from Prairie Lights Bookstore in downtown Iowa City. Apparently, though, a number of forces conspired to drive listeners away. The show's host was boring. The readers (like many readers) didn't perform their work with any particular flair. And the show ran once or twice on air which, as you and I both know, simply ain't gonna fly in an age of YouTube and podcasts. Are you gonna rearrange your schedule, wait until 8 pm, then tune in your crystal set to listen to a boring reading followed by an even more boring set of questions? "Poetry & Popular Culture" sure isn't. But the old-time codgers here in Iowa City—many of whom haven't listened to "Live From Prairie Lights" in ages (and many of whom would privately admit that the show actually is pretty boring)—have been lamenting the passing of the wireless torch and the demise of the radio show. How horrid, they say, that on the eve of being designated the world's third city of literature Iowa City should strip away its literary radio programming. Some heavies like former Iowa Poet Laureate and Writers' Workshop teacher Marvin Bell and current Iowa Poet Laureate Robert Dana have weighed in on the controversy. 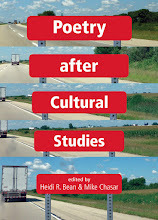 And what follows is Mike Chasar's take on the topic, a view officially endorsed by "Poetry & Popular Culture." Congratulations, Iowa City, for being designated UNESCO's third City of Literature. Via the Iowa Writers' Workshop, the International Writing Program and other innovative and historically significant literary efforts, you have changed the way writing happens in the United States and around the world. It is now time to remember that history, stop lamenting the disappearance of "Live from Prairie Lights" from Iowa Public Radio and seize on that disappearance as an opportunity to reimagine what such broadcasts might look and sound like in a digital age where podcasts and YouTube reach a much larger audience than WSUI and Julie Englander ever could. Literature has long been a part of public and commercial radio programming. In the 1920s, poetry radio shows emerged as popular parts of the media landscape. Some shows -- like Ted Malone's "Between the Bookends" and Tony Wons's "R Yuh Listenin'?" -- were broadcast nationwide and had large, avid audiences who not only waited by their sets to hear poems read aloud to live organ music, but who flooded the studios with fan mail as well. At the height of his popularity in the 1930s, Malone's show received more than 20,000 fan letters per month. Much as I hesitate to mention that other state university north of Ames, you can go there and read some of these fan letters yourself, which are now in the Arthur B. Church Papers in the Special Collections Department of that university's Parks Library. Malone and Wons weren't the only ones to dazzle first generation radio audiences with poetry. A.M. Sullivan's "New Poetry Hour" on WOR (New York) strove to broadcast poetry of only the highest literary quality. Eve Merriam's Out of the Ivory Tower on WQXR (New York) featured Leftist poets reading their work. Ted Malone was known for showcasing "amateur" poetry sent in by his listeners, but he also read poetry by Shakespeare, Keats, W.B. Yeats and T.S. Eliot. And on the eve of World War II -- when radio was the major source of up-to-the-moment news for many Americans -- NBC broadcast Edna St. Vincent Millay's book-length propaganda poem "The Murder of Lidice" to a nationwide audience of millions. It was performed by Hollywood actor and two-time Academy Award nominee Basil Rathbone and was accompanied by a chorus of singers. Not only was that broadcast shortwaved to England and Europe, but the poem was translated into Spanish and Portuguese and beamed to South America as well. Those days may be over, but audiences still await -- though they're not sitting in Prairie Lights, nor, apparently, are they sitting by their radios diligently tuning in to Iowa Public Radio. Instead, they are online watching "The Daily Show" and Tina Fey impersonate Sarah Palin on YouTube. They are downloading podcasts. They tune in at their convenience, but they do so in enormous numbers. "Live from Prairie Lights" should find a model in President-elect Barack Obama, who recently gave the weekly Democratic radio address not just on radio, but also for the first time on YouTube. If, as one university official claimed, "Live from Praire Lights" is a "standard-bearer" for Iowa City's literary culture, then it should not be constrained by the time tables of either a bookstore or a public radio schedule. It should be recorded in video and audio formats. It should be posted online for listeners to access at their convenience -- at a coffee shop, at work, or even (anachronistic as it might sound) at a fireside. The readings of Iowa City's writers and visiting writers should be posted on YouTube where people not just in Iowa City, but around the world, can access them. Imagine the global audiences who might tune in to hear participants in the International Writing Program read from their work. If "Live from Prairie Lights" really is the "gem" that people say it is, then why not share that wealth with as many people as possible? That would not only be a move in keeping with Iowa City's leadership and innovation in arts and letters, but the mark of a true world city of literature as well. Saw this poem re-printed from the Sept. 23 1751 edition of the Boston Evening Post and thought of you. Doesn't this fit with your thesis in some way? Earlier time period to be sure, but still, it proves your point. Meant to educate and delight, this poem was the first recipe for chowder to appear in this country. Its musicality and rhyming may have made it easy to remember, as many colonists never learned to read. Then Biscuit next which must be soak'd some Time. You may make Chouder for a thousand Men. You'll have a Mess which some call Omnium gather 'em. With its fourteen lines of rhyming couplets, this fishy sonnet is indeed a delight, although "Poetry & Popular Culture" has its suspicions about any poem claiming to be "the original" or "the first" of anything. However, more than one history of chowder cites the poem as originary, so I'll not, ahem, stew over that aspect of the recipe for now. What intrigues me about "The Original Fish Chowder" is its print history. To begin with, I wonder why the recipe needed to be printed by the Boston Evening Post in the birthplace of chowder in the first place. Was there a chowder duel that this poem attempted to resolve? A longstanding feud about to boil over? Was some chowdery flash-in-the-pan marketing his or her new brand of soup and thus threatening to eclipse the original? Indeed, by harnessing the Augustan heroic couplets of poet-essayist Alexander Pope (who died seven years before the recipe was published), the poet of "The Original Fish Chowder" affords this particular recipe a certain authority it wouldn't perhaps have in prose. Perhaps even more interesting is the fact that "The Original Fish Chowder" has been reprinted in Martha Stewart Living of all places—a fact that you, dear correspondent, neglected to mention in your missive to "Poetry & Popular Culture." Why did you clam up so? Were you ashamed to admit that you've been dallying in these pages? Why the hush, puppy? It appears that Martha's in touch with our favorite side of American literary history, and for that, I hoist a tall one in her name. A few weeks back, my friends over at Vowel Movers were crowing about a perfect pair of poetry pumps from Nine West that went perfectly with their Sylvia Plath dresses. Ever on the lookout for new and interesting footwear, "Poetry & Popular Culture" is happy to call attention here to the "Poetic License" brand line featuring lyrically trendy styles such as "Romance," "Tranquility," "Venom," and the "Breathless" Mary Jane pictured to the left. Hopefully now, Vowel Movers, you'll finally be able to work those Gertrude Stein slacks—or your Elizabeth Barrett Browning hoop skirt, or that Edna St. Vincent Millay twin-set, or even your Beowulfian bodice—into a complete outfit to take on the town. Carrie Bardshaw, eat your heart out. While "Poetry & Popular Culture" is hardly in the business of dispensing advice on matters sartorial, it nevertheless can offer a poetry pamphlet, "The Shoe Day of Judgment," in the way of a gentle cautionary tale. Produced in 1900 by the St. Louis Wertheimer-Swarts Shoe Company, manufacturers of Clover Brand Shoes (not Joshua Clover Brand Shoes), the pamphlet is a warning for those who might all-too-casually slip "Venom" or "Romance" onto their hoofers and go about their daily lives, wearing those shoes hither and thither, willy-nilly through sleet and snow and city and countryside with little consideration for the well-being, care, and feeding of the shoes themselves. "The Shoe Day of Judgment" begins with a short preface, "Abuse of Shoes," explaining the man- ufacturer's complaint and appealing for "some sense": too many people hold a shoemaker responsible not for flaws in workmanship but for the consumer's irresponsible misuse. "There is nothing," Wertheimer-Swarts proposes, "that clothes mankind so much abused, and yet is so unreasonably expected to continue Perfect in Fit, Style, Workmanship and Service, as are its Shoes. We appeal to a fair-minded, thinking public to give a few facts their consideration. No two persons wearing the same grade and make of shoes will realize the same service. Leather will wear out. Gritty soil, briars, rocky and rough surfaces, Scuff and Peel soft, velvety uppers. Fine mellow tannages of leather in footwear exposed to extremes of weather, to Heat and Cold, to Mud and Slush, will crack. Seams put to such tests Rip. Failure to care properly for your shoes, by frequent cleaning, oiling and dressing, exposes them to rapid destruction and decay." And walked on glass and stones. These are not worth a cent!" His mien was most severe. While "The Shoe Day of Judgment" may be a harrowing tale, its use of poetry as both a tool for advertising and instruction in the consumer marketplace is not unusual, as virtually every product was hawked via verse at one time or another during the latter half of the nineteenth century. Back then, poems were employed for their prestige or entertainment values. Nowadays, though, at least to judge from Nine West and Poetic License, the title of Poetry is grafted directly onto the product itself, because what can be more reassuring in our uncertain age than knowing that what we buy—indeed, even the very act of buying—is where, in fact, the poetry's at. How to say it except to say it straight? and he was giddy and smiling, and it wasn’t a sham. "OMG! Buddhist Nun Texting Novel"
"Dinosaur Descendant to be Dad at 111"
"Cat Chasing Mouse Leads to 24 Hour Blackout"
"Man Faces Jail for Smuggling Iguanas in His Prosthetic Leg"
" 'Lingerie Mayor' Vows to Stay in Office"
"O.J. Simpson Questioned in Vegas Incident"
Mind you, the border at Nogales is not easy on the eyes, nor is its landscape a particularly poetic one—at day or night. A huge corrugated steel fence topped with razor wire runs as far as the eye can see up the hill in both directions, decorated on the Mexico side with artistic memorials for those who've died trying to make the cross. Not easy on the eyes. Not easy on the soul. And not easily poeticized. Indeed, what sort of relationship between the U.S. and Mexico was the U.S. border guard trying to enact by erecting the excerpt from "At Night" (first published in Matthew Josephson's avant garde magazine Broom: An International Magazine of the Arts in 1923)? How are we supposed to read the stars of the poem—"foreign, / uninterfering"—in this border context? Is it supposed to be descriptive of Mexico? Is it a fantasy about the way the U.S. would like Mexico to be? Is it comparing the idealized stars, "like nothing / in my life," to the actual state of border politics which is anything but uninterfering? Is the focus on the stars rather than on real circumstances a wish to wash away the reality of border violence? It's not entirely clear how we're supposed to read "At Night" in this borderland, but "Poetry & Popular Culture" can't help but find the desire to be "relieved and comforted" a fatuous one on the part of U.S. border police. This is made all the more confusing by the fact that Williams has been chosen as this border's bard. As we all know, the Good Doctor was born in, and lived most of his life in, New Jersey—far from the Mexico/Arizona border. While Hispanic in origin, the "Carlos" in his name does not come from Mexico as the monument's placement suggests, but from Puerto Rico where his mother was born. Despite the bilingual English/Spanish translation of the marbleized poetry, Williams's Hispanic roots themselves have little to do with Mexico or this part of the U.S.
As a poetic ambassador intended to ease—or get people to ignore—the pains of the border fence and the separation of families and loss of lives that that fence represents, this monument is as grotesque a failure as the corrugated steel and razor wire itself. Leave it up to the politicos to not only attempt to beautify or distract us from the ugliness of their policies, but to then confuse the relationship between the U.S. and Puerto Rico with the relationship between the U.S. and Mexico—lumping all Spanish speakers into one idealized "foreign, / uninterfering" group of people! The Good Doctor must be rolling in his grave. Earlier this week, "Poetry & Popular Culture" received a tip from Stephen Headley—Manager of the Magazines & Newspapers Department at the Public Library of Cincinnati & Hamilton County—who said that a "bad poetry file" existed somewhere in the depths of that library's collection. Headley put me in touch with Bruce Sherwood, a reference librarian and 30-year veteran of the library, who confirmed that said archive does in fact exist but under the name of the "Auxiliary Poetry File," known as APF for short. A unique, home-grown index comprised of fifty-five boxes of yellowed index cards with author/title citations to poems culled from selected magazines, newspapers and grade school readers in the early part of the twentieth century. 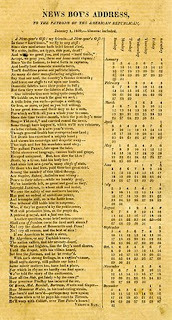 Presumably intended to augment Granger's Index to Poetry, this covers lesser poets or, "bards not sublime," published in non-literary periodicals such as Life and Stars and Stripes and includes many full-text poems from local newspapers -- hand cut and pasted by librarians on three-by-five cards. Although limited in time and scope, this is an irreplaceable resource because there is no known index to newspaper and textbook verse. Selection is heavy on World War I-era patriotic verse. The APF is especially treasured by those of an earlier generation who wish to recall poems they once memorized from their McGuffey readers. Affectionately referred to by staff as the "Awful Poetry File," perhaps because most of the poems are "awfully" hard to locate and a few are just plain "awful," the APF has been somewhat eclipsed in purpose, if not coverage, by the World Wide Web. "Although the file has been largely supplanted by the Internet, it is also no doubt true that a large percentage of the entries will not be found elsewhere. It is arranged in a Granger's Index style, with entries for authors, titles, subjects, and first lines in one alphabet. 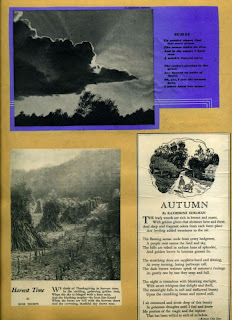 Not all of the poems are 'bad,' nor do all of the 3" x 5" cards consist of pasted clippings from newspapers and magazines. 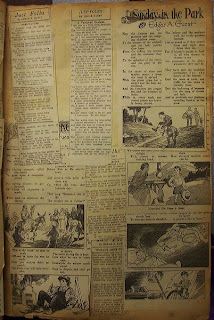 Some entries are just locational notes (e.g., 'Wharton, E. -- Hunting song, Literary Digest, Vol 38, p. 816'), and some are cryptic, such as the title listing for 'A Hymn of Hate,' which is attributed to Dorothy Parker and shown as occurring in five nonsequential issues of Life magazine in the early 1920s. "During my tenure in Literature and Languages and its predecessors (1980-2007), it was used mainly as a last resort in the years before World Wide Web searching became commonplace. That is, after following up all hunches and tediously checking the many volumes of Granger's, a meticulous search required a run through the APF. At that point the exhausted librarian could confidently tell the patron that he or she had searched EVERYWHERE. "Before Google, the APF was a significant (if incomplete) source for ephemeral verse. In public libraries, poetry texts are frequently requested by the elderly, who are trying to remember a poem learned in the single-digit years. Then there are many who want the 'correct' text of a half-remembered poem they may have seen on a greeting card or wall plaque. If they could remember the first three words of the title or first line correctly, then the APF could sometimes help them." I can't speak for the readers of "Poetry & Popular Culture," Bruce, but I will go to sleep happier tonight for knowing the APF exists. And I will hope that some affluent reader of this blog comes up with a cool fortune to help the library digitize & make searchable this amazing resource.